This is the second in our series by a close sympathiser examining the formation of the British state in the 17th and 18th centuries. The first article in WR 352 showed how English capital expanded to dominate the rest of the British Isles, and why attempts to form an independent capitalist state in Scotland failed. Here we turn to the case of Ireland, and then draw some conclusions about the strengths and weaknesses of the modern UK state and their implications for the class struggle today. 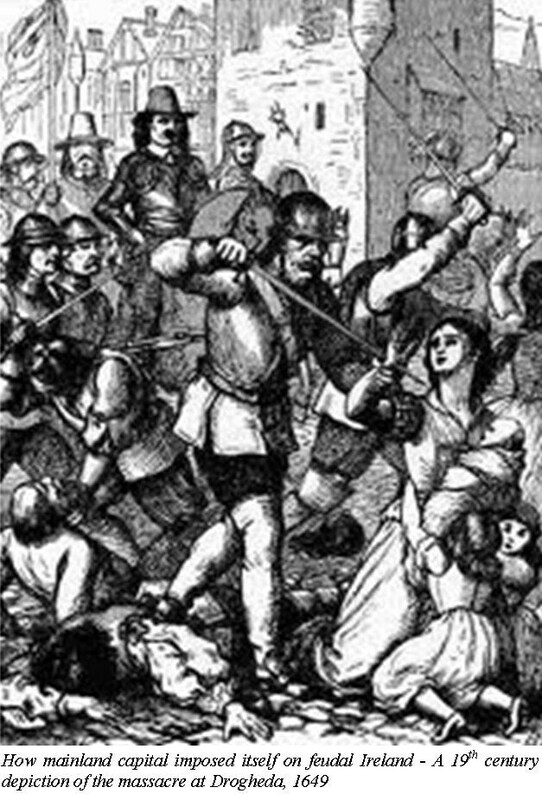 The subsequent English re-conquest of Ireland, which included the infamous massacres at Drogheda and Wexford, was followed by military occupation and the mass confiscation of land, effectively destroying the power of the Catholic nobility and subordinating the Irish state to the interests of English capital, whose ruthless campaign to impose itself on the island decimated the already impoverished Irish peasantry. From the survey carried out for the government and completed by William Petty in 1656 it has been estimated that over 618,000 people died in Ireland between 1641 and 1653, about 40% of the population, with around 12,000 exported as slaves. Not surprisingly the brutality of this bourgeois revolution from the outside left a lasting legacy of hatred and resentment.
. For the ICC’s position on the Irish question, see for example, ‘Irish republicanism: weapon of capital against the working class’ in WR 231 (https://en.internationalism.org/wr/231_ira.htm).
. See the series on ‘Lessons of the English revolution’ in WRs 323, 325 and 329.
. Trotsky, Through what stage are we passing? (1921) (http://www.marxists.org/archive/trotsky/1924/06/stage.htm).